This story was updated at 1:33 p.m. EDT. WASHINGTON — With just 12 days to go until its Mars arrival, NASA's Phoenix lander isfunctioning well and on course to be the first mission to land in the frigid, arcticregions of the red planet, NASA officials said today. A plannedmaneuver to adjust Phoenix?s course was canceled last Saturday because thespacecraft is on track for its May25 landing, said Barry Goldstein, Phoenix project manager at NASA?s JetPropulsion Laboratory in Pasadena, Calif. Another maneuver is set for thiscoming Saturday. NASA alsoreleased enhanced images of Phoenix'slanding site, located at 68 degrees north latitude, 233 degrees eastlongitude in Vastitas Borealis, the northern arctic plains of Mars. Thislatitude corresponds to northern Canada, just below the Arctic sea, saidPhoenix principal investigator Peter Smith of the University of Arizona,Tucson. Below thesurface layer of dust in these plains lies a layer of water ice mixed with sandand dust. During its three-month mission, Phoenix will use its 7.7-foot(2.3-meter) robotic arm to dig up samples of this dirty ice and analyze it withonboard science instruments to shed light on the history of water in theMartian arctic and see if the icysoil could support life. In these polarregions, ?there?s a very large abundance of water,? Smith said. ?We expect atremendous abundance of ice in the landing site.? Phoenix ispicking up where its ill-fated brother, the Mars Polar Lander (MPL), left offafter it failed to make a safe landing in at the Martian south pole in 1999.Though it will use nearly the same landing strategy, Phoenix contains differentinstrumentation to explore the planet. ?Phoenix istruly an appropriate name for this lander as it has risen from two Marsfailures,? said Ed Weiler, associate administrator of NASA?s Science MissionDirectorate. The$420-million mission launchedlast August and has traveled about 422 million miles (679 million km) toreach our red-hued neighbor. The lander currently has about 10 million miles(about 16 million km) left to go before setting down in the Martian arctic. Phoenix isslated to touchdown at 7:53 p.m. EDT (2353 GMT) on May 25. Unlike its rovercousins Spirit and Opportunity (currently exploring closer to Mars' equator),Phoenix will not use airbags to land. Instead, it will rely on a set of rocketthrusters that will fire in slow pulses to slow the craft down during itsdescent, similar to the design for the MPL. The lastsuccessful use of this landing approach was 32 years ago with NASA'sViking landers in the 1970s. Missionscientists said that the known problems with the MPL have been addressed andfixed, along with several other problems engineers later identified, thoughthey cautioned that that doesn?t rule out unforeseen issues. ?Althoughwe?ve fixed all the known issues from the MPL, remember, there is always theunknown unknown,? Weiler said. 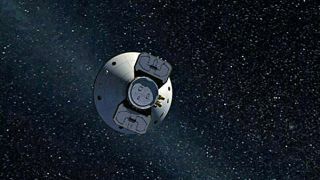 Ray Arvidson,chairman of the Phoenix landing site working group, said that the team at theUniversity of Arizona, Tucson, where the new lander?s operations will be based,will be taking the instruments through their paces in the critical first daysafter landing. ?It?s allscripted,? said Arvidson, adding that Phoenix scientists and engineers haveprepared for a number of contingencies after landing. Such issuesmay include problems with instruments, power failures and obstacles such as arock lying in the way of the deployment of the solar arrays that will power thelander throughout its three-month mission, until the sun sets at the end of theMartian summer. ?The riskswill certainly be there, but the rewards will absolutely pay off,? said DougMcCuistion, director of the Mars Exploration Program. The Phoenix mission?spotential wealth of information about Martian soil, the history of weather ofMars, as well as the state of water in the planet?s current climate outweigh therisks of another failure, he added. NASA's MarsReconnaissance Orbiter and Mars Odyssey have been repositioned to track descentof Phoenix and relay communications between the lander and Earth during its?seven minutes of terror? falling through the Martian atmosphere, as Goldsteinput it, and once the spacecraft is settled on the planet.